The other day I was trying to get started with Mono using ASP.NET MVC. 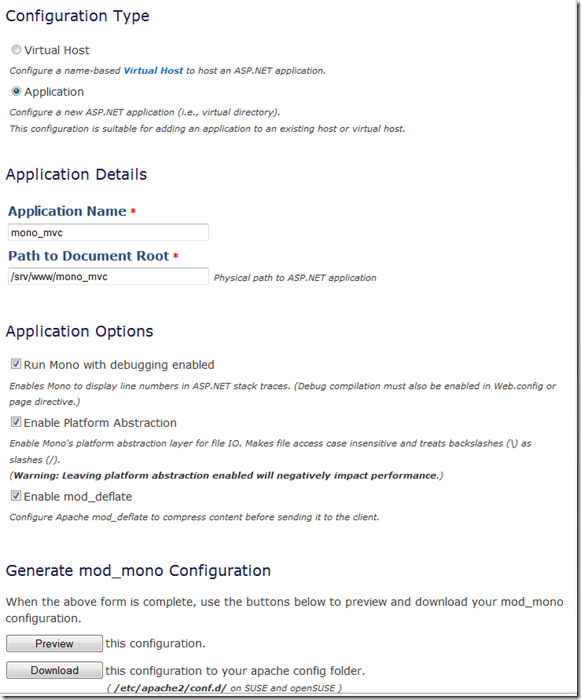 As usual I googled and found a useful post on it http://beyondfocus.com/mono/asp-net-mvc-on-mono-two-options-for-the-ide-crowd/ . But, the post assumes you already know how to deploy an asp.net app on Mono. Anyway here is my attempt to make it easier for folks to hop onto Mono. You need to download a Virtual Machine image from http://www.go-mono.com/mono-downloads/download.html OR install Mono 2.4, apache, mono_mod, and xsp if you already have a linux machine up and running. Visual Studio with ASP.NET MVC 1.0 installed. Publish this application to a folder, say d:\binaries\mono_mvc. and then copy it to your Mono linux machine, copy it to the /srv/www/ folder. Once you’ve done that, head over to the http://go-mono.com/config-mod-mono/ to create your mod_mono configuration file. Fill out all the necessary details and click on the Download button to download your newly configuration file. Copy this new configuration file to the /etc/apache2/conf.d/ directory on your linux machine. This is obviously a contrived example, but you can see how easy it is to deploy an asp.net mvc application to a linux box running apache and Mono. This is no more complicated than deploying a web app on a Windows box, and all props go to the Mono guys for making Mono easier to use with every release. I hope to dive in deeper into Mono real soon and I’ll share my experiences with you guys.